When my family rode out the aftermath of Hurricane Ike in 2008, we were off the grid for two weeks and used many emergency items purchased from the Dollar Store. At the time, we were paying off lofty debts and didn’t have the money to buy brand name items. Many of the items I purchased, I outlined in the first week of 52-Weeks to Preparedness , but there are many more Dollar Store finds that I wanted to list today. 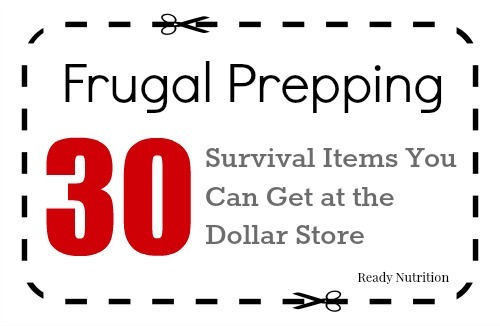 Below, are thirty prepper-related items you could easily find at your local Dollar Store or Dollar Tree. The listed items are supplies for one person, so if you have other family members to consider, multiply some of the supplies by the amount of family members. This calculator  could serve as a starting point for items you may want to keep an eye out for.